I saw potential for something seriously practical here. It's a given that an underslung Swarmfire is a great addition to any rifle system, particularly in HvZ. Furthermore, there isn't any pressing reason why an underslung cannot be mag-fed, and successful prior art here includes a Stryfe underslung on a Nitron by the HvZ Forums user JPRoth1980. Semi-auto .50 caliber is not really my thing for integrations, though - it either fires something bigger (like a big foam rocket or ball to kill special zombies in certain games, or a multi-projectile load of darts) or it's full auto and readily spammable, or it's just not worth adding the bulk and weight. So this RS hung underbarrel was a natural evolution of the Swarmfire underslung. And the fact that it's on a RS may be funny, but ultimately, that is simply because the RS is the latest and greatest rifle out there. I have called this build "Rapid2", pronounced "Rapid-squared" as a play on "Rapidstrike". 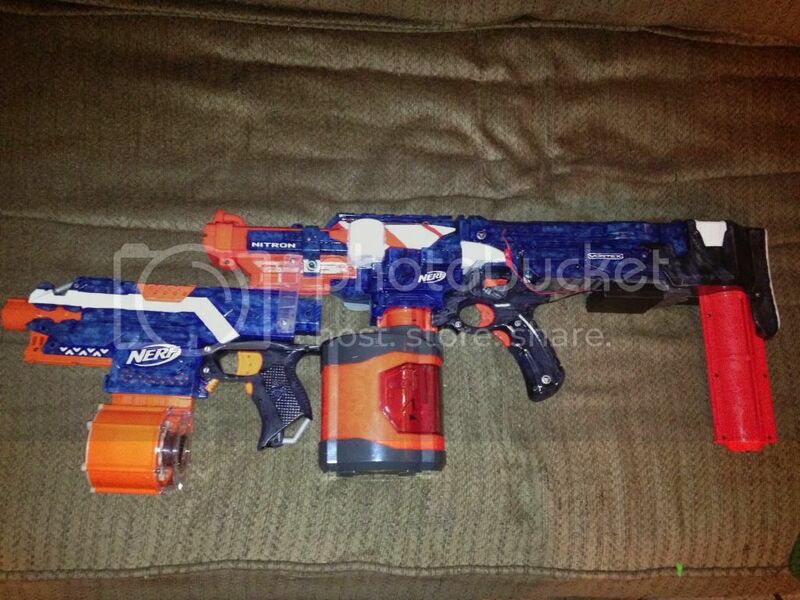 I did get some WIP internals and assembly photos on the HvZ forums, but it's really quite straightforward. The underslung RS has the receiver chopped so as to get the flywheels and pusher as close as possible to the barrel of the host RS for minimum bulk. Both these RS currently have some holes in the receivers that need patching directly over the pusher box on the left clamshell. The reason is that these were earlier serials which had glue between the pusher box and receiver. The safest and most effective method to defeat this glue is to do what I did: grind away the faux dust cover down to an easily patched flat surface. Drilling is risky and makes the bodywork harder, not easier, afterward. You can also see how close the pusher box in the underslung RS comes to the host's flywheel cage. The twist-lock barrel nut has been cut off the spacer that fits into the barrel shroud and a longer inner barrel installed. The jam door on the underslung is welded in place on the right clamshell and shimmed up with PVC sheet to reach the host barrel shroud. This assembly keeps a pseudostock appearance with the jam door, but "fills in" the missing port area in the receiver with structural material for a stronger assembly to the barrel shroud. As usual, that union was made with methacrylate plastic welding adhesive and is rock solid. Swarmfire-derived, old style trigger pack for the integration. The control strategy for all these flywheels and pushers is unique. Early plans had the integration independent with its own flywheel switch, but the ergonomics and bulk caused this option to be discarded. Next up for consideration was the use of a big multipole switch and some clever wiring to share one trigger pack with both RS, but this was also discarded, since it would negate the ability to fire both weapons simultaneously or in rapid succession without first reaching for and operating a selector. Ultimately, both sets of flywheels were connected to the same grip switch in the host RS, and the pushers remain independent with the host fired by the host trigger and the underslung fired by this 203 pack up front. A disadvantage of this approach is that two hands are required to fire the integration. I see this as a necessary evil, since there is no feasible, clean, safe, reliable method of implementing a 2-trigger single-handed setup. These tend to be either unergonomic or prone to causing negligent discharges (or jams, if a RS were to be triggered erroneously). With a new grip frame, it could be done, but I am a 2-handed traditional user for the most part. Remember that deal I was talking about with the stick pack in the RS stock? Well, this is set up for that, but I don't have the cells or the time yet, so that is one task yet to be done. Another? Fix the bodywork and clean up some random odds and ends. And the third? Put carbon brushes in all 6 currently stock RS motors that are in this thing. As it stands, the pistol flywheel motors are good and perform well with a nice speed match, but the rifle motors have something wonky going on with the brushes, a type of defect these flaky inconsistent metal-brush beasts are prone to, and they don't rev like they should nor do they match worth a damn, and the velocity shows it even with Stryfe flywheels installed. While I could put Blades in one or both RS, I will most likely stick to carbon'd RS motors. Cleaner, quieter, and the loss of a few FPS is not exactly detrimental. I already have a showoff highly tuned Blade RS that has a banshee scream, winds up frighteningly fast and dumps mags in under a second to nearly the century mark on demand, but I actually like the practicality of my RapidPistol against zombies. With this one I am going to stick to stock on 2S for both flies and pushers (like the RapidPistol) because 460RPM is enough and the lower velocity enhances accuracy. Not insane and ultra-high-performance, but perfectly matched to HvZ as an efficient gameplay tool, and that after all is one of my specialties as a modder. "winds up frighteningly fast and dumps mags in under a second to nearly the century mark on demand"
Its a terrible video though. You're right, it deserves more. Century mark would be with elevation of course (you can always look at the chrono data for how it REALLY performs without the usual range cheating). do you have a guide or instructions for building this mod (for somebody with very little modding experience)? If I had it, I would have posted it. If these become popular (this is one of a kind at the moment), I may do a mod guide. not to necro or anything, but what is the status of this beast? It's still around. Last game I loaned it to a squadmate and due to my absence from the general area while I change up some school stuff, it is still in their possession. I made it a stick pack, that I will post the installation of when I get it back. I haven't fielded it much in actual HvZ, as I found that I like the response of Blades, the multi-speed Blade pusher and underslung swarmfire, and getting used to this is an adjustment. I do think changing to blades or Xtremes on the rifle including pusher, and picking up a 25 round drum mag for the underslung, will help it out a bit.